Teleflora is a well-known company that hires individuals to work from home selling floral arrangements as well as non-floral gifts. They employ over 3,000 people worldwide in 20 countries. Positions with Teleflora can be both seasonal or temporary. Seasonal work is a great way to get your foot in the door and open up the possibility of a permanent management position, as most permanent positions are hired for internally. Seasonal workers are hired for the busiest times of the year. These seasons are around Valentine’s Day, Easter, Mother’s Day, and Christmas. These positions involve answering inbound calls. Agents can choose to work one or all of these holiday seasons. Teleflora hires full-time positions as well. These team members handle sales, service, and escalated calls. They also answer team member questions. Senior Team Members are also responsible for training and coaching new seasonal employees. Work-at-home team leaders are hired from current work at home agents. These employees coach other agents on their performance requirements. They are also responsible for completing proper documentation, staffing the help desk, and training new agents to begin working at home for Teleflora. Once you are hired, you will earn between $8 and $11/hr plus commission. Benefit packages at Teleflora are offered to permanent employees and include Medical, Dental and Vision Insurance. Vacation and Holiday pay are also offered, as well as, 401(k) and tuition reimbursement. You will be required to submit a background check if you are considered for a work from home position with Teleflora. Training for seasonal jobs is 16 hours long and must be completed before beginning work at Teleflora. This training is completed at home and is paid at your state’s minimum wage. Schedules may vary from week to week. Which means working for Teleflora may not mean having a consistent schedule and may require flexibility on your part. Working holidays is required, given the market of the business. In order to be eligible for a position with Teleflora, you must have a high school diploma or GED equivalent. Applicants with customer service experience is preferred. To get started, search current job listings for Teleflora. You can leave both the keyword and location fields blank to see all of the current listings at Teleflora and see if there are any work from home based positions. 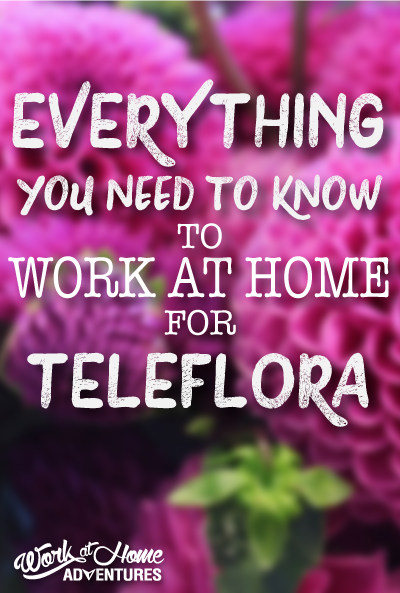 What do Other People Say About Working for Teleflora? At the moment, there’s a healthy 70 Teleflora reviews written by current and past employees at Glassdoor. Of those 70 reviews, the overall rating of Teleflora is 3.3 out of 5. The Pros and Cons vary. Many of the Pros are in regards to the benefits and the fact of being able to work from home. The Cons are often in regards to low pay and inconsistency in requirements. A few people mention feeling pressured to close more sales, which can be stressful if you do not have a sales type of personality or the proper training. However, on a positive note. I was happy to see that Teleflora responded to several reviews, which is often only something a company who cares about improvement does. If you choose to pursue a career with Teleflora during their hiring seasons, I wish you the best of luck!